While many Iowans are planning a barbecue for the last summer holiday, others are putting together millions of meals to feed the hungry. Bruce Nelson is one of the organizers of the Meals from the Heartland effort that’s underway at Hy-Vee Hall in downtown Des Moines. He says they have funding to package 3.6 million meals, and need about 45-thousand more dollars to reach their goal of four million meals. 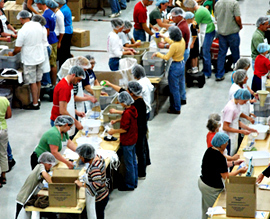 The meals are sent to starving people in South Africa, Haiti, and Jamaica. The volunteers are putting all the ingredients for the meals into bags that can then be cooked. Nelson says the meals have a rice base, a vitamin caplet, a hydrated vegetable mix and a protein mix that are all put into the package and will feed six people. He says with the volunteer help to put them together, they can help feed thousands at a very low cost. Each bag costs $1.50 and that breaks down to 25 cents per meal for the six people. This is the second Meals from the Heartland effort and Nelson says the response has been even better than the first time around. Nelson says they have been overwhelmed with volunteers from across Iowa coming to the event. 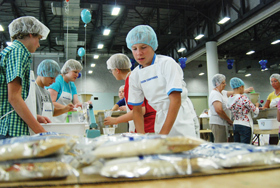 Last year they had 12,000 volunteers and this year they have over 14,000 volunteers helping to package the food.